As normally no subject of the scene is really close to the camera when shooting images for panorama from the top of a giant pole (e.g. 269 HDBU from Manfrotto), there is usually not much parallax problem to fear from. The entrance pupil should oddly be located in order to prioritize the balance of the payload by placing the CoG of the rotating assembly (Camera + Lens + remote control receiver) right on the rotation axis. This odd way should minimize the oscillation that is caused by elasticity and the subsequent pole flexion. Paradoxically, the parallax errors are then less than when placing the NNP at its normal location. An other way to damp the pole oscillation is to install a triple rig system especially when the wind comes into play during outdoor panography in the open. By contrast, shooting at close range (i.e. few inches away) of a subject that is say 20 to 35 feet above ground level with a camera mounted on top of the Manfrotto 269 HDBU giant pole is a real challenge even in the quiet ambiance of a high room (e. g. in a church). If one wants that image to be stitched with other images that are all shot with a fisheye (for instance) then that is then not exactly a cushy job! ...unless you put an easel on the pole uppermost section that shall completely stop the unwanted motion and not only damp it. This is a really simply made device: a sleeve ring and two legs. Think of a machine gun resting on its feet. The ring can revolve freely around the mast upper section because there is some play between the ring sleeve and the tube of the pole. That means also that when the sleeve is restrained from rotating, the pole tube can still freely revolve inside of the ring e.g. when the feet at the tip of the two legs of the easel are put to rest on the subject to be photographed. To make the legs stiff and light, I have used some fiberglass tubing that is sometimes used for building the skeleton structure of a big kite. Thus the entrance pupil is constraint to stay at a fixed point in space during the shoot as well as during the rotation of the pole for the next photography shooting. Parallax error are then minimized. 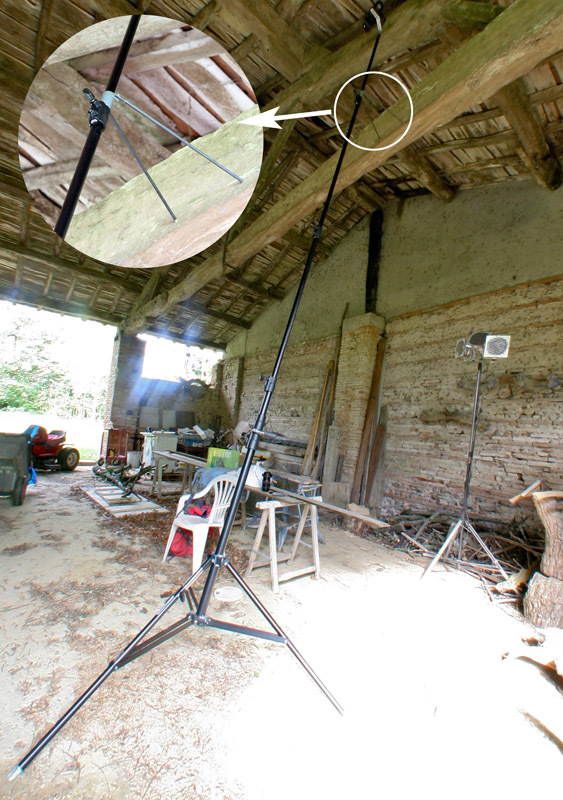 The telescopic pole on which the easel has been installed and on top of which the camera is ready for the shoot, is deployed. Then it is slightly and carefully let to lean toward the subject until the feet of the easel legs nearly but not touch the supporting object. The camera should be revolved until it is at the greatest distance from the subject in one complete turn. Then the pole is inclined slowly until the feet just gently rest on the support. When the camera shall be made to revolve, the feet shall never be lifted from resting as the C.o.G is not on the rotation axis (as the NPP is on this axis). Be careful if it's windy: that's a fearful operation! Additionally if the inclination ever becomes to high and if the stability of the whole mast is endangering the operation, you then better should put some counterweight on the leg of the tripod that is the father away (i.e. the telescopic leg that allows to incline the pole). Another way is to use a long nail hammered in the ground to fix the foot of this longer leg (see the red arrow on this image). All this of course is advisable if you really cannot get the tripod a little closer to the nadir of the subject to be photographed. That gear shall be used for instance for photographing a feature or detail at close range such as a foot -or less- of distance while the camera is some 25 feet in altitude. I'm not only referring to panographic shooting here but a special close range lens or a macro photographic lens can be used. From my early testing of the system, aperture as small as f/16 or f/22 coupled with 5 seconds of exposure can then give the optimum depth of field without any blur. This way is probably preferable to shooting with a long tele-lens on a tripod but from below. BTW shooting with a long focal isn't always possible as you always need some distance for that. For 360 degrees panorama shooting, the NPP can there be kept at the right and fixed location in space even in the worst conditions for shooting on top of a giant pole (long duration shot, low light and some light breeze). Tip: it may be sometimes feasible to hide part of the easel legs (as well as a part of the tripod and its legs) by letting the easel to rest on the back of the subject to be photographed while the pole tripod is also put behind it. Think for example of shooting from above and in front of the head of a statue while the easel is resting behind the nape of its head. 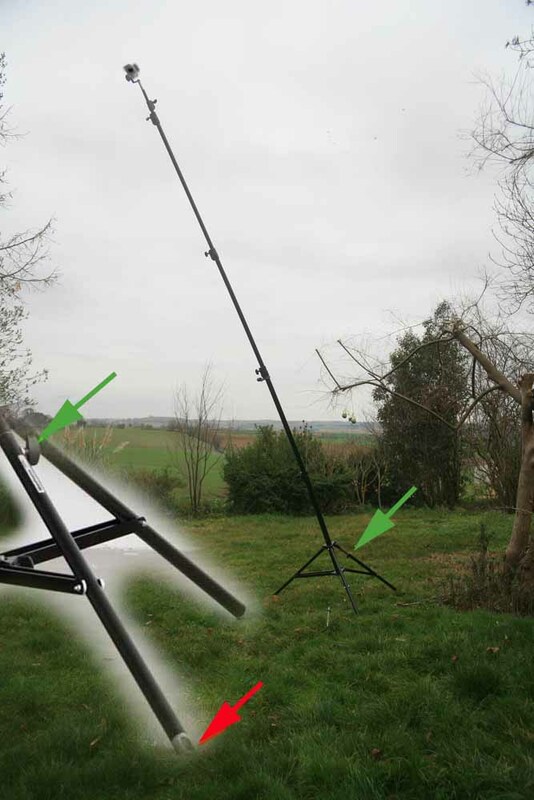 The unavoidable flexion of the pole is there used for the benefit to help hiding the tripod. I am planning to photograph again Jeanne d'Arc (that's a five meter high statue of Joan of Arc) from about thirty centimeters in front of her head and aiming toward her (blue?) eyes. I would like also to gently let the easel rest on the back of the shoulder of the statue of Pierre Goudelin that was erected long time ago on the center of the place Wilson in Toulouse; I would then have the camera set vertically and right above the fountain in front of the poet (in contrast to what is shown on the photo, it is not always closed). I would love to put the white foam of water at the true natural Nadir of the panorama. This is impossible to have with the normal way without damping the tripod in the water. I might also redo this pano and avoid this time the numerous parallax errors that were unavoidable because of the very short distance from the wall and from all those painted curved beams on the ceiling nearby. .... and many other things of course!